Unable to escape, no ability to communicate outside the inhabitants of Dressrosa are trapped. They citizens are randomly attacking one another. Doflamingo challenges the citizens to “stop the game”, or die trying. King Riku begs Doflamingo to stop. Doflamingo challenges the citizens to either kill him or join him. He offers the citizens “100,000,000 Belly for each star”. He ascribes stars to his opposition one star to Franky, Viola, Kinemon, Robin, and Rebecca. Two stars to Curos, Zoro and three to Luffy, Law, Riku and Sabo. As Usopp lays please that he wasn’t mentioned, we are surprised to learn that he saves the highest star count (5) for him. 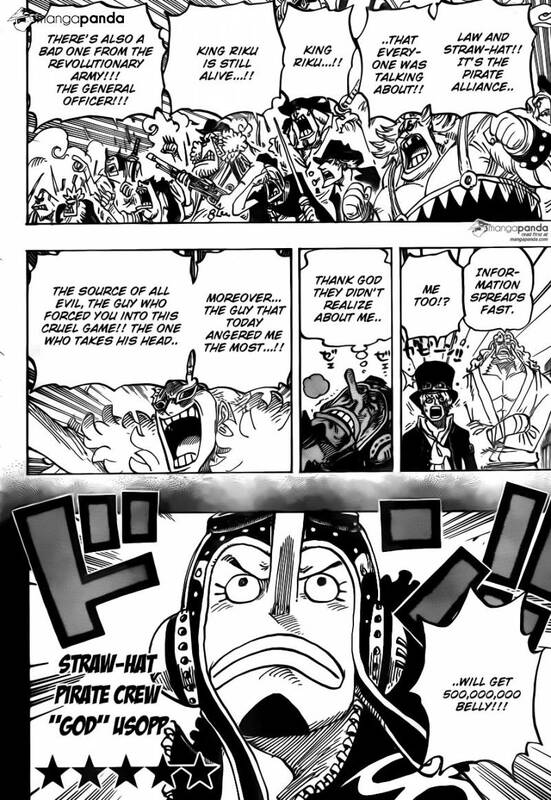 Many of the citizens quickly turn on Usopp and the others. Curos goes on a tear, attacking the convicts. 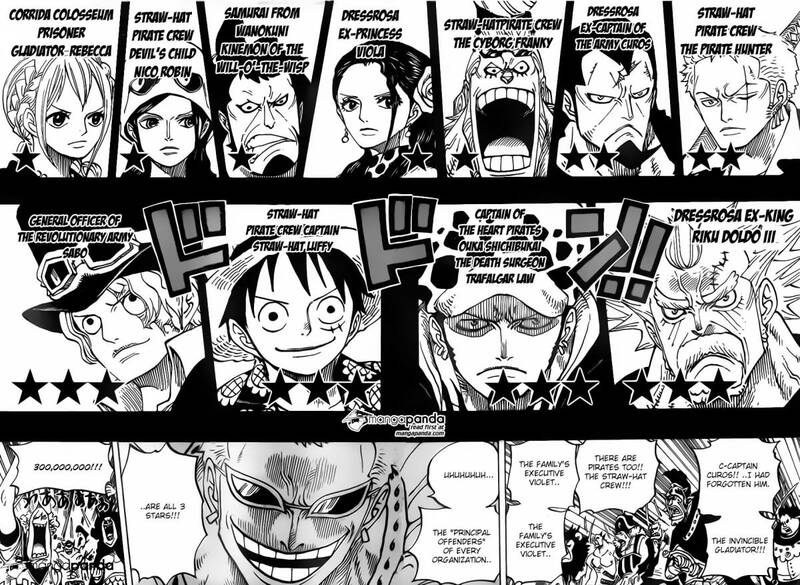 Meanwhile, the marines states that they “can’t capture Doflamingo” and their goal is Luffy and Law. This chapter was more of a set up chapter. Doflamingo is very clever with his “game”, turning the convicts against his top opposition. Appealing to their greed by adding numerical value to each star he ascribes to his enemies. 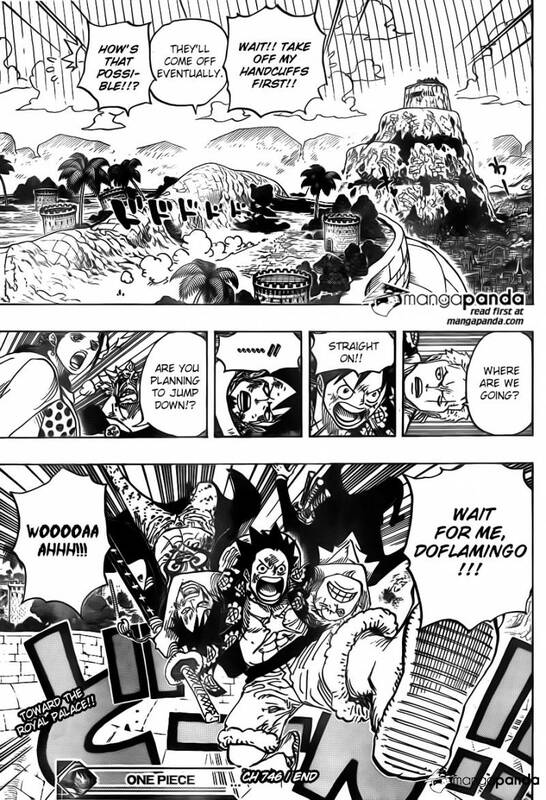 The largest surprise clearly must be the fact that Usopp was made the primary target by Doflamingo. However, he is responsible for destroying Doflamingo’s plan so it makes sense. Gremmy wonders why he failed to gain the power, resulting in him killing himself was it his imagination. 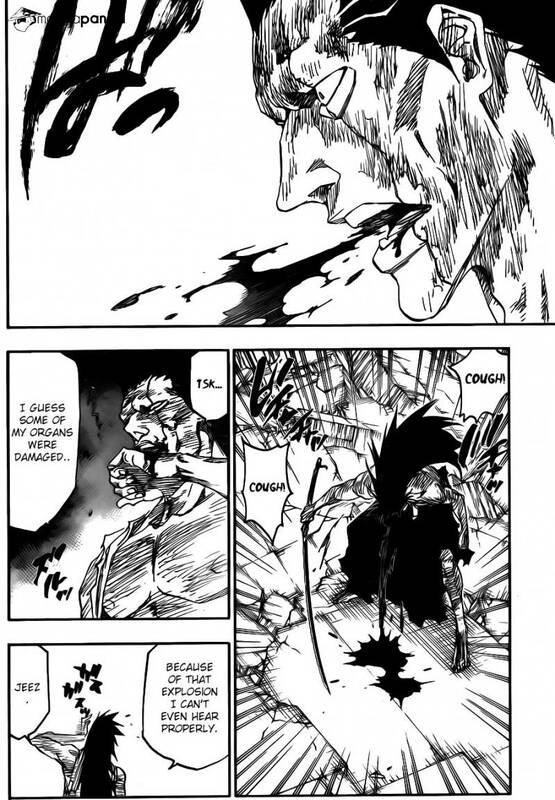 He concludes that his death was due to the fact that “Kenpachi’s body is the only one that could with stand his power”. Gremmy disappears revealing himself to be a brain only and stating that his body was also apart of his imagination. Kenpachi appears to be mildly injured. He wonders were Yachiru is as he notices her empty clothing on the ground, and orders his subordinates to find her. They are quickly destroyed by lightning from four of the female sternritters arrive. 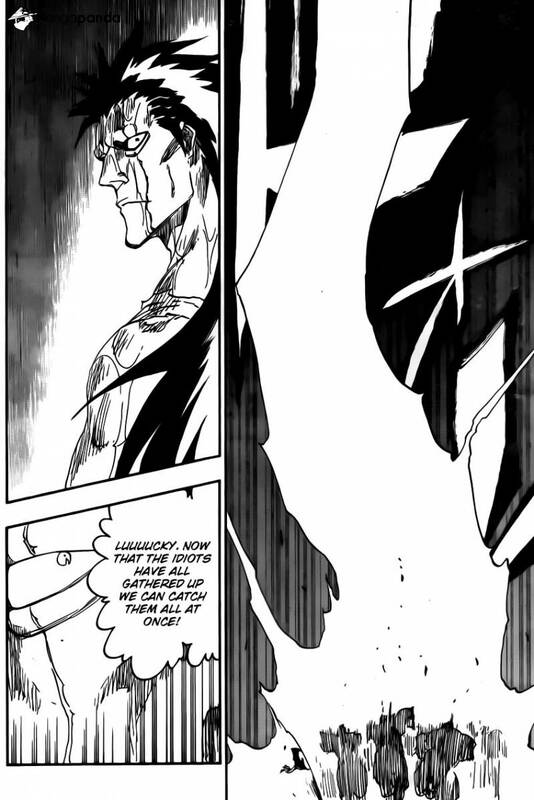 Very little happened in this chapter, it was mostly the conclusion of Kenpachi’s fight and the set up of what might be another fight with Kenpachi against the female Sternritter. I’m hoping that he does fight them as his fight with Gremmy was disappointing. The “disappearance” of Yachiru is surprising, but I doubt she’s dead. Madara attacks and Obito responds with “Kamui” saving Sakura. She informs Sasuke and Kakashi explains that Obito wanted her to crush his rinnegan. She tends to Kakashi who lost his sharingan. 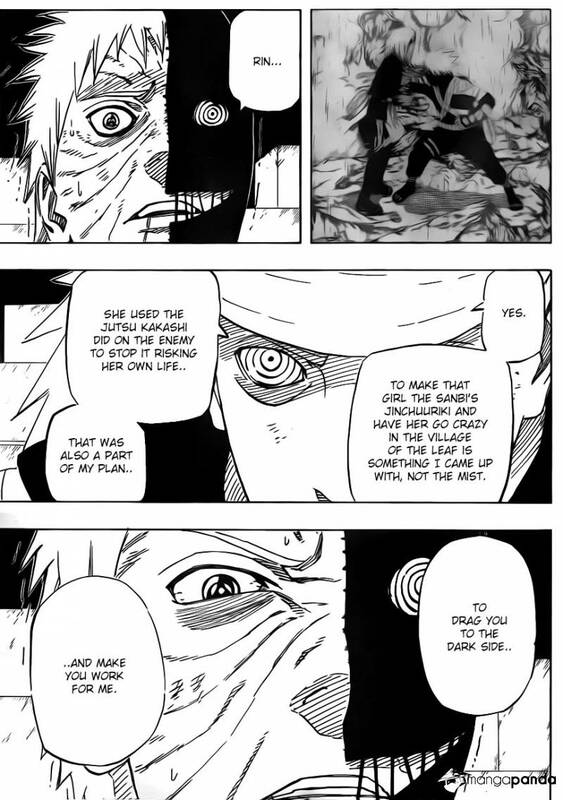 Madara wonders how Obito removed his seal, and Obito explains that he had Kakashi remove it. Madara reveals that he used the same seal on Rin and she also used Kakashi to remove it. He claims that it was “part of his plan” so that Obito was driven “to the dark side” and join him. Naruto seal Madara’s shadow and joins Kakashi, Sasuke and Sakura. 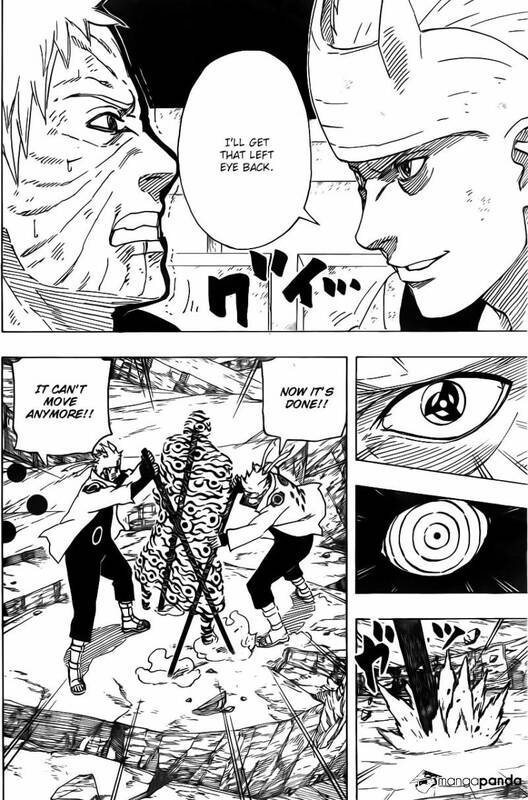 Naruto replaces Kakashi’s eye with a normal one, Kakashi remembers Sasuke, Naruto and Sakura’s goals from childhood. Kakashi asks Sasuke what his new dream is but Sasuke hesitates. Kakashi senses that Madara is returning and reminds “Team 7” of their old lessons of team work. This chapter featured no fighting but was interesting. I found the fact that Madara “plan” was a bit ridiculous and highly improbable. While, I think that the manner in which both Rin and Obito freed themselves from the “puppet” seal using Kakashi’s Chidori was kind of clever. The idea of team 7 (Kakashi, Naruto , Sakura and Sasuke) fighting together against Madara feels right. 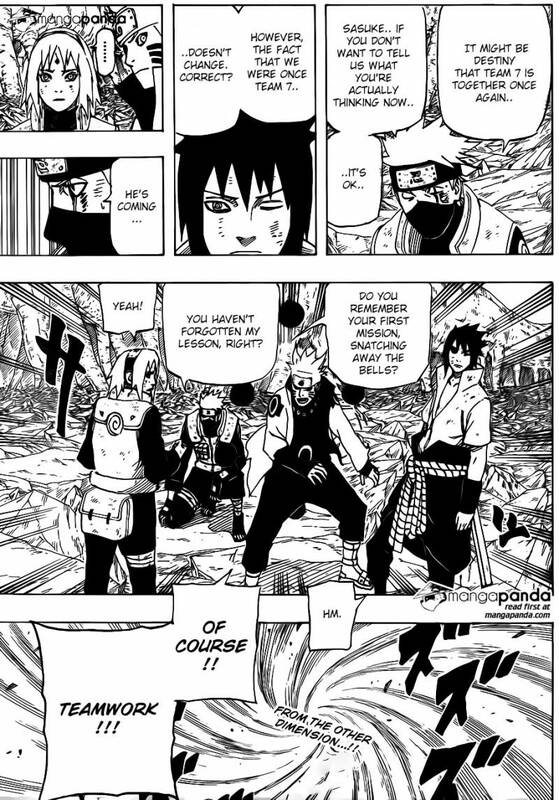 However, I doubt Kakashi (sans Sharingan) and Sakura will be of much help. Maybe Sakura will heal them but other than that I don’t expect much. Kakashi probably will be more useful, but this is still going to be about Naruto and Sasuke.